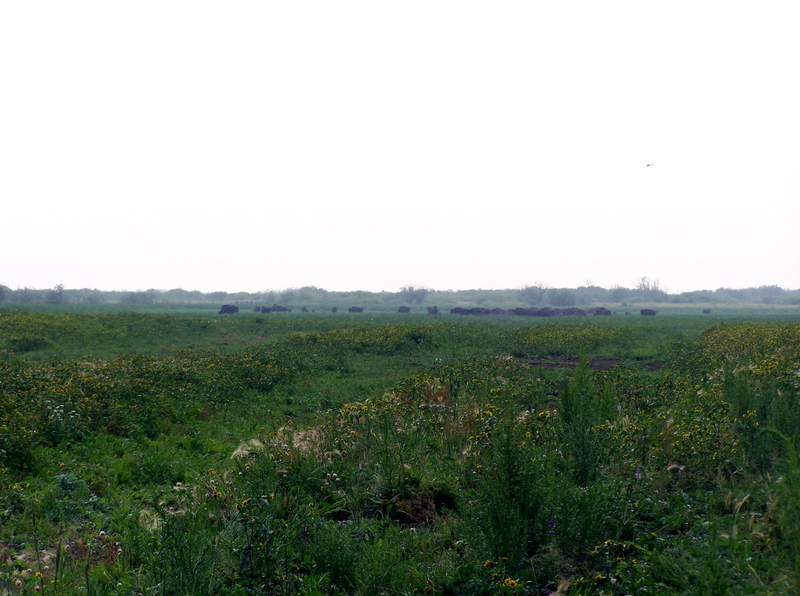 There is a large herd of wood buffalo (latin name bison bison athabascae) living near Hay-Zama Lake. They are amazing to see in the wild — seeing the herd on the open prairie sparks one’s imagination about what the West must have been like long ago. 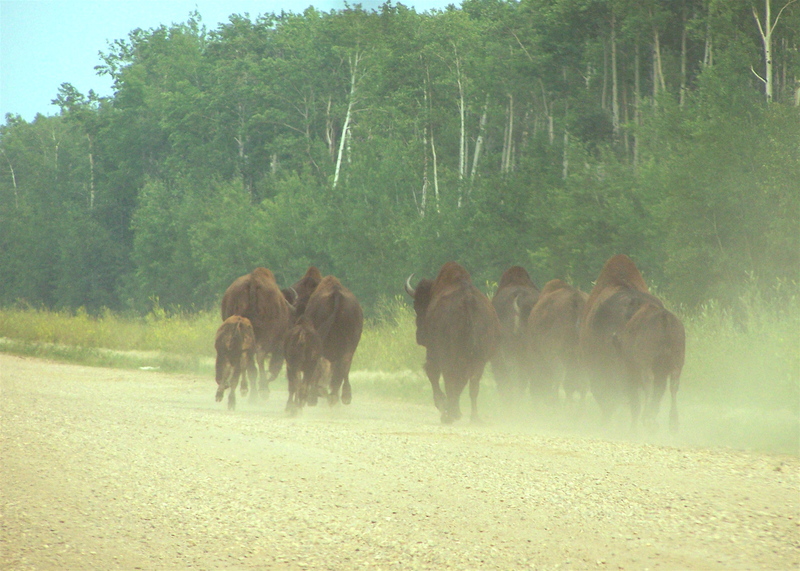 They are independent of the buffalo in Wood Buffalo National Park. They were introduced to the Hay-Zama area in 1984, where they have thrived due to the environment and abundance of sedge grasses for them to graze. There are now approximately 570 individuals. You can see them on the plains hear the lake and along (or on) the roads in the area. If you do meet one, don’t drive fast and honk your horn. This will only make them angry, and when the herd is angry, one of the male buffalo will charge your vehicle. If you think hitting a moose is bad, multiply that times 100 for a charging buffalo! The proper thing to do is drive slowly towards them, which will only annoy them, and they will leave the road and allow you to pass. I guess in buffalo psychology, they want to get away from what’s annoying them, hoping/knowing that doing so will let it pass, whereas something that is seen as a threat must be dealt with strongly/defensively. Since this herd is so healthy, hunting is allowed. Initially, most permits (tickets) were given to aboriginal people living in the area (Assumption/Chateh reserve), but now all the tickets are distributed by a straight draw. In 2009, 100 tickets were given out of over 6,800 people who applied. 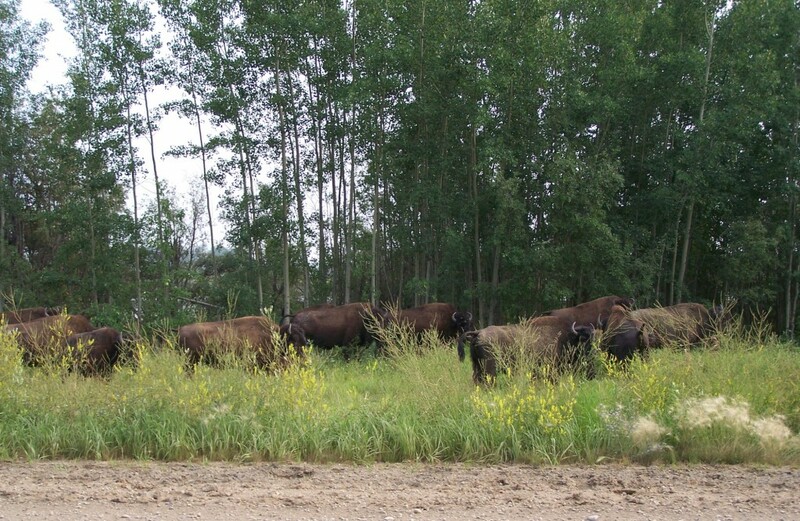 There is some concern over the wood bison in this area contracting diseases such as brucellosis or tuberculosis from the ones in Wood Buffalo National Park if they should intermingle. For that reason, I’ve heard that any bison spotted east of Hwy 35 are open-season, all year long. The reasoning goes: if it’s a buffalo from Hay-Zama, they don’t want it going back to its herd with a disease, and if it’s one from the east, it is well beyond it’s normal territory and could spread disease to healthy animals. Notice that all the bison have horns? Both males and females grow horns throughout their lifetime (they don’t shed them each year). Their horns show annual growth rings, and unlike deer and elk antlers, are made of a substance similar to hair. Rutting season runs from June to September (coinciding with paddling season!) 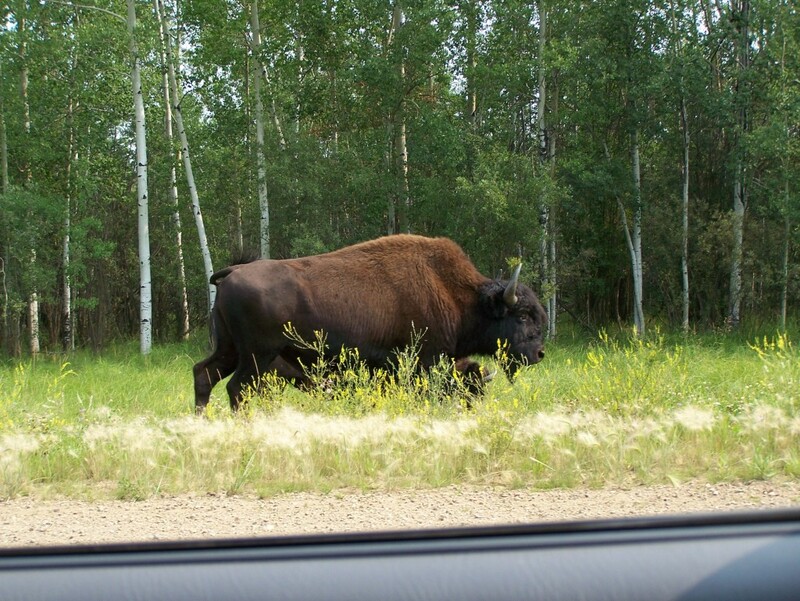 so if you see a bison, be extremely cautious and give it LOTS of space. They can be very unpredictable and therefore should not be approached or annoyed, especially if you are in the wild without a vehicle (such as paddling or hiking). By the way, you can use the term “bison” or “buffalo” interchangeably. Bison is the latin name and buffalo the common name.